The United States plans to counter the rapidly expanding economic and political influence of China and Russia in Africa, where the nations use corrupt business practices with little regard for the rule of law, according to prepared remarks by US national security adviser John Bolton. The United States’first priority will be developing economic ties in the region to create opportunities for American businesses and protect the independence of African countries as well as US national security interests, he said in the prepared remarks. 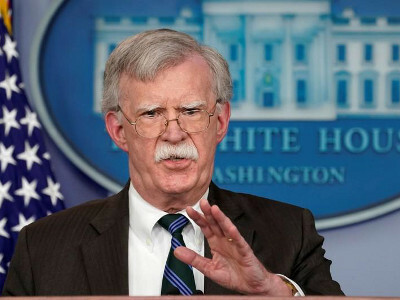 “Great power competitors, namely China and Russia, are rapidly expanding financial and political influence across Africa,” Bolton said. Bolton’s speech at the Heritage Foundation, a conservative think tank, comes as President Donald Trump and Chinese President Xi Jinping, leaders of the world’s two largest economies, seek to resolve trade disputes that have roiled global markets and created economic uncertainty. “China uses bribes, opaque agreements and strategic use of debt to hold states in Africa captive to Beijing’s wishes and demands. Its investment ventures are riddled with corruption,” Bolton said in his remarks. Bolton had equally harsh words for Russia. “Across the continent, Russia advances its political and economic relationships with little regard for the rule of law or accountable and transparent governance,” he said. China’s development policies in Africa are a concern for Washington as the United States seeks to ramp up development finance in the face of China’s global ambitions. The head of the US Overseas Private Investment Corp (OPIC) said in July China is saddling poor nations with unsustainable debt through large-scale infrastructure projects that are not economically viable. In October Trump signed legislation overhauling federal government lending for foreign development, creating a $60 billion agency intended largely to respond to China’s growing influence. The new the US International Development Finance Corp combines OPIC and other government development organisations. Xi’s “Belt and Road” initiative, unveiled in 2013, aims to build an infrastructure network connecting China by land and sea to South-east Asia, Central Asia, the Middle East, Europe and Africa.